Keep your group alive by keeping the online presence active, many people dont do this and lose out on opportunities to grow the hobby near them. Respond to people, and let them contribute ideas. You may have started the group, but letting people contribute is a large part to keeping the group going and growing. Always be polite to people, but ask people to keep politics, religion and other non-gaming topics off the groups pages. Scout Around and find a location to meet at. Game Stores are a good spot to meet, but many dont have the gaming space needed, and wont want to let you play there if it is not generating revenue for them. Understandable. Restaurants that have a slow night can be good choices. Speak with the manager of a restaurant when they are having a slow night. They may want you in the restaurant and give your members a discount. Again if it generates nothing for them then they may not want you around for long. A local group that has a free night. The Elks lodge, Knights of Columbus, etc. If they dont run events every night may be willing to let you use their space. It may cost a small amount. Your home. This is obvously the easiest and cheapest way to game, but is limited in space, unless you are very rich. You may be able to have a few tables, just make sure that if you do this that people know there is limited space. Bring Name Tags and Sharpies. Letting people know each others names right off the bat takes away some of the social anxiety people have. Make sure that you are ready early, as some people arrive early. Make sure that you have games that you can teach people new to the hobby. Having games that are too complex for people will just make them not want to return. Be prepared to teach new people games, it will help them get started and help them get to know you. Alweays be ready to teach them to beat you. The Mantra in our group is that the teacher should always lose. You may want to plan games at certain times, so people know when to show up. Once you start getting regulars they should be able to use Facbook to speak with each other and start to be able to help you out teaching new people. 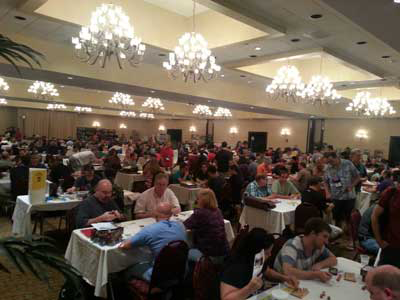 We all want more people in the hobby, but as organizer you set the tempo for your group. Not everyone is going to be nice or fun. Just dont worry about it, as people decide for themselves if they will have fun. Don't be afraid to ask people standing around if they want to play a game, or if there is room for one more. Most gamers want more people to play with and usually don't mind teaching a game either. If you don't you may not get to play all the cool games you want to. Don't stress out about it being something you are responsible for. EVERYONE is here to have fun. If someone is rude speak to them privately, and if needed ask them not to come back. MOST IMPORTANTLY Relax and have fun, that's what this is really all about!